We'll make a more detailed hardware inspection when we do a proper preview, but for this introduction of the Samsung Galaxy Note II we'll just cover the interesting bits. The display and S Pen are arguably the most interesting hardware features, so they get their own chapters. 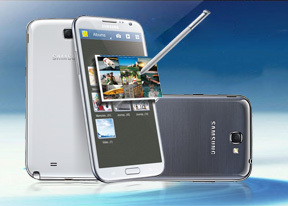 The Samsung Galaxy Note II takes the Galaxy S III design and upscales it. It has roughly the same surface area as the original Note, but is slightly taller and narrower. It's also a bit thinner and the weight is practically unchanged. The narrower device does feel slightly better in the hand, but it's still a large slab - it's a full 10mm wider than the already big Galaxy S III. Yet the Samsung Galaxy Note II is not too hard to pocket - it might not fit every pocket, but it's entirely possible to carry it around like a phone. As far as connectivity goes, the Note II will come in two versions - HSPA+ and LTE. Both use the same Exynos chipset, but the LTE version has an additional modem (some Samsung handsets switch to a Qualcomm chipset for their LTE versions). The Samsung Galaxy Note II only has a couple of wired ports, but between them they handle all the needed functionality. The 3.5mm audio jack on top does wired headset and headphones duty, while the microUSB port on the bottom handles charging and data connection with a computer. It's also MHL-enabled, so you can output HD video through an HDMI adapter or use USB Host functions with another adapter. The back of the phoneblet looks pretty barren - it houses an 8MP camera and a single-LED flash near the top and the loudspeaker near the bottom. The camera protrudes slightly, so the Note II rests on it when you place it on a level surface. Samsung used the same hyperglazed plastic to construct the outer shell of the Galaxy Note II as on the Galaxy S III. It comes in Marble White and Titanium Grey. The back cover is removable and below it you'll find the beefy 3100mAh battery along with the microSIM and microSD card slots. The SIM card is blocked by the battery. There will be a flip cover accessory for the Note II. It's the same as the one the original Note and the Galaxy S III got. It replaces the back cover and provides protection for the screen. The flap is made of leather. A lot of people were hoping that Samsung would move to a non-PenTile screen for the Galaxy Note II and the Koreans delivered. They changed other features of the screen too, like the surface on top, which is now Gorilla Glass 2. Also, the diagonal grew to 5.55" (up from 5.3") and the aspect ratio changed - the Galaxy Note II uses a 720p screen (16:9) instead of WXGA (16:10). 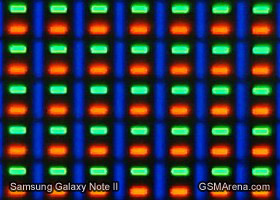 What this amounts to is a taller, narrower screen (and consequently taller, narrower device) and a slightly increased surface area - the Galaxy Note II screen has about 2% more surface area than the original Note. The removal of that 80-pixel wide strip resulted in a slightly lower pixel density - 267ppi vs. 285ppi. The new matrix, however, makes up for that easily and the perceivable sharpness of the screen is actually higher. It's no longer a PenTile matrix like on the original Note (which had a slight crosshatch patter noticeable, but only if you look really closely). Perhaps these photos snapped with a digital microscope will help clear up the differences in pixel arrangements. 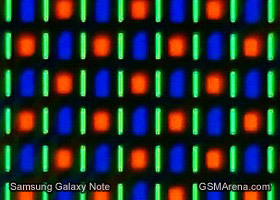 The pixels of the Note II have one tall Blue sub-pixel on the left and smaller Green and Red pixels stacked one on top of the other. It's an odd arrangement, but it has three subpixels per pixel. The reason for the different Blue pixel is that Blue AMOLEDs typically have a shorter life and making them bigger balances things out. Also, the Blue pixel doesn't shine as brightly, which also improves its life, but doesn't affect color balance (because it's bigger). To illustrate how the different arrangement improves sharpness we used our microscope to snap a picture of very tiny text - the line width here is 1px, the font is white. 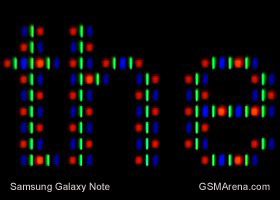 As you can see, the Galaxy Note II screen lights up individual pixels to display the 1px-wide lines. 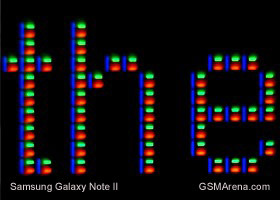 The old Galaxy Note, however, can't use a single pixel as each individual pixels can't make white, as it only has two of the three needed colors. To fix that, the screen uses sub-pixel rendering, which "borrows" a subpixel from a neighboring pixel to make white. But now the line has become 1 2/3px wide. This new arrangement seems to result in some very slight color aberrations around sharp edges, but it takes a great deal of eye-strain to try and see it. One cool addition to the display settings is that even with Automatic brightness turned on, the brightness slider remains active. This allows you to fine-tune the brightness, but still have it adjust automatically to the environment. The Samsung Galaxy Note II grew in size over the original and so did the new S Pen. The old one is about 10.4cm long and 5mm thick, while the new one measures 11.3cm in length and 7mm in thickness. While nowhere near as comfortable as the S Pen on the Galaxy Note 10.1, the one that comes with the Note II feels more like a pen and less than a stylus, compared to the one inside the original Note. The button on the S Pen now has a ribbed pattern, making it easier to find by touch (the old one is flat and flush against the surface, which made it tough to use). The Galaxy Note II can detect when you pull the S Pen out and brings you to a contextual page, which offers shortcuts (with preview thumbnails) of your recent S Notes. Since there's no lanyard linking the S Pen and the Galaxy Note II, the phoneblet uses it's accelerometer to detect you walking away and will alert you if the stylus isn't in its slot. The feature is pretty conservative and won't trigger until you're several steps away - so you can walk and write without it bothering you, but if you really forgot it and walked away it will start beeping. The Note II also features a more sensitive digitizer compared to the original. It can distinguish between 1024 different levels of pressure (quadruple what the original managed) and you can really feel the difference in the drawing apps - you get fine-grained control between thin and thick lines. The Galaxy Note II and its S Pen enable plenty of interesting functions throughout the software, so let's have a look at those now.